To maintain clear roads, municipalities often apply de-icing material by the ton over the course of a winter, at enormous cost. Obviously, driver safety is paramount, but when it comes to snow and ice treatments, more isn't necessarily better. Spreaders for granular deicers typically use either tailgate-mounted or V-box designs. A conveyor belt or auger moves the salt or sand from the truck’s dump box to the hopper, where it cascades down onto a spinner that broadcasts the material across the roadway. Basic spreaders broadcast at a constant number of pounds of material per unit time, no matter what the vehicle speed. More sophisticated electrical designs allow the driver to manually adjust the density. The FORCE America system takes a different approach, combining electronic spreader controllers, groundspeed data from the vehicle, and closed-loop feedback to automatically apply a set number of pounds of material per mile, no matter how fast the vehicle goes. The result is rapid response from a system that maximizes safety and optimizes resource use while minimizing the burden on the operator. It's a great idea in concept but as with many engineering projects, the devil is in the details. Plow vehicles operate in punishing conditions that make industrial environments look mild, including dirt, moisture, repeated melt/freeze cycles, high shock, and constant vibration, not to mention the corrosive ice-melt material itself. 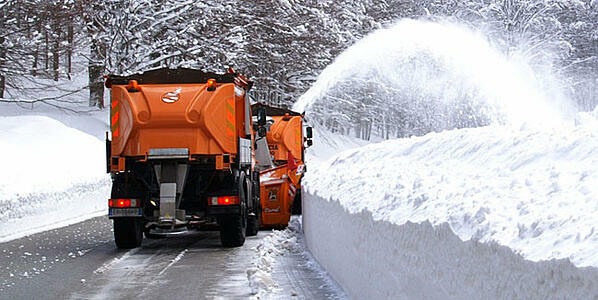 At the same time, road clearing is the very definition of a high-reliability application. Equipment may be idle nine or 10 months out of the year, but when the first subzero winter storm hits, it needs to power up without a hitch and operate around the clock to keep the roads safe. The FORCE America engineering team started out by specifying the HD20 harsh-duty optical encoder with an IP67 ingress-protection rating. The new encoder operated at 360 PPR. This was a good resolution but the device still included moving parts that made it vulnerable in the harsh operating conditions. The team asked for another option and was directed to a more robust alternative: a hall-effect encoder sensor. In a Hall-effect array sensor, a magnet attached to the shaft being monitored magnetically couples to a sensor module. The sensor consists of an integrated circuit that combines detector and processor electronics in a single chip. Alternating magnetic poles on the rotating magnet cause the magnetic field at the detector to vary as the shaft turns, generating a series of digital pulses. It's a robust, high-performance approach, and because the sensor module is lithographically fabricated, it benefits from the economies of scale introduced by batch processing. Hall-effect array sensors tend to be both robust and tolerant to misalignment. The HDN58 Hall-effect encoder can perform effectively with up to 0.25 in. of shaft runout and an air gap as large as 0.5-in. This makes it usable not just for new systems but as a retrofit for units already out in the field. Even better, the electronics of the HDN58 are sealed and potted, earning it a rating of up to IP 67 (protection from dust and immersion in liquid). Finally, it can be configured to deliver CANbus-compatible output. 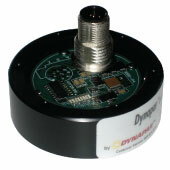 The HDN58 provides another important advantage—it is a contactless encoder design. The original encoder was a housed design with a shaft that needed to be connected to the coupler. With the HDN58, the magnet can be placed on the shaft and the detector module merely needs to be fixed nearby. That eliminates a bearing and a point of failure, increasing lifetime and decreasing maintenance requirements. The normal installation process for the contactless encoder involves fixing a magnet on the coupler shaft using a screw. Unfortunately, that approach was incompatible with the FORCE America design, which required a threaded hole in the center of the coupler. Dynapar was able to customize the target magnet to make it physically compatible with the coupler. The Dynapar team also modified the housing so that the connector projected from the side to facilitate integration. To serve customers facing budget pressures, FORCE America wanted to offer a version with a somewhat lower-resolution encoder. Modifying the stock device required the Dynapar team to make changes to the standard circuit layout and to the firmware. Once designed however, the new lower PPR version was approved after a short round of acceptance testing and making the change was a smooth process for the customer. The customized HDN58 hall effect encoder is now widely used in FORCE America’s salt spreader controller. FORCE America Inc. is one of the leading suppliers of motion and control systems in North America. For over 60 years, FORCE America has provided systems and components to the on and off highway mobile markets. For more information, visit www.forceamerica.com or call 1-888-99-FORCE.